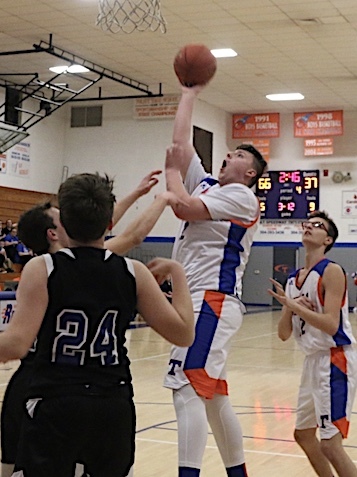 FORT GAY, W. VA. — Tolsia improved to 14-6 on the year with a 68-47 victory over Rose Hill Christian ( 4-23 ) Monday at Rebel Arena as the Rebels played 15 players in the first quarter after being held scoreless for the first five minutes of the game. Trey Brumfield with the basket against Rose Hill. Brumfield finished with 6 points off the bench. Freshman Anthony Lovins hit two three pointers, Senior Peyton Watts hit another and Sophomore Trey Brumfield scored a basket as the Rebels led 11-8 after one period. In the second quarter the Royals kept it close as Stephen Barker fired in 9 points and Chase Pennington 6 points but Tolsia led 31-27 at the break. In the third quarter the Rebels broke the game open with a 22-5 advantage and led 53-32 going into the final stanza. In the fourth Tolsia led by as much a 31 before Rose Hill scored the final 10 points of the game to set the final score. Austin Salmons led a trio of Rebels in double figures with 12 points, Jacob Mollette netted 11 points, Jesse Muncy tallied 10 points. Watts, Brumfield, Lovins and Gavin Meadows finished with 6 points apiece, William Spaulding and Rob Cantrell 4 points each, Blake Sturgell hit a three pointer and Braxton Williams chipped in with 2. Tolsia hit 6 three pointers and went 7-10 from the line. Rose Hill was led by Stephen Barker with 27 points, Chase Pennington 14 points, Ian Justice 4 points and Chase Yates 2 points. The Royals hit 7 three pointers and went 6-7 from the line. NUTTER FORK, WVA. 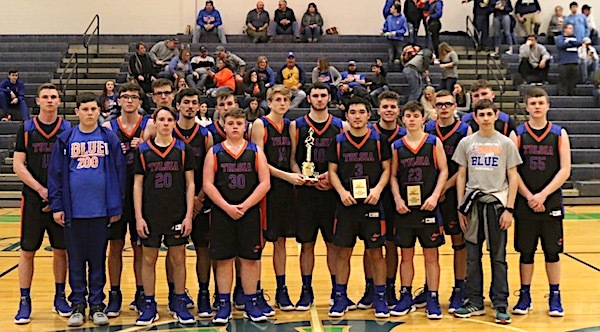 — Tolsia traveled to Robert C. Byrd High school and played in the West Virginia Hometown Invitational Tournament Championship game and lost to the #5 team in Class A 85-49 to the much bigger Cavaliers who boast 6-8 Twins. The Rebels fell behind 25-4 after one period and never could recovery. The Rebels went 3-1 in their first ever appearance in the Class A public school tournament. 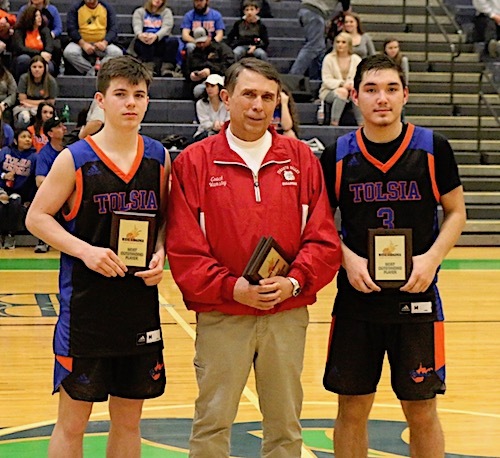 Jacob Mollette and Jesse Muncy who both made the All Tournament team finished with 15 and 14 points respectively to pace the Rebels. Tyler Johnson tallied 8 points, Austin Salmons and Rob Cantrell finished with 3 points each, Gavin Meadows, Trey Brumfield and Peyton Watts had 2 points each. WV HIT All Tournament members Jesse Muncy and Jacob Mollette along with HIT President Tom Wamsley. Tolsia hit 9 three pointers and went 4-8 from the line. Greenbrier West hit 6 three pointers and went 10-17 from the line. Tolsia will return to action tonight at Fairview, Ky with JV at 5:45 and Varsity at 7:30.